In addition to observed temperature increase and changes in weather patterns, climate change can be seen in the way plants and animals react to new developments in their environment. Many forecasts have been made over the last few decades, predicting that species will expand their ranges north, or uphill, or to deeper water as higher temperatures allow them to explore new areas, or force them to abandon old territories. Much of what is available currently deals with what is likely to happen; here, we deal with what is happening. On this page you will find species-specific information about the reactions of New England wildlife to the changes in our climate. The Lazuli Bunting is native to western North America, and very rarely comes to New England. There have been two sightings in the past, but what the other thing that makes this visit special is that this bird is usually in Mexico in February. It doesn't stay in California for the winter, let alone a place as cold (historically) as Massachusetts. While an exciting event for Massachusetts birdwatchers, the presence of this bunting in the American Northeast in winter months is indicative of how warm the winter of 2011-2012 was, and of how strange things are getting on our planet. The American Lobster has a long history in New England, from its role as a food for the poor in colonial times, to its current role as a delicacy. It has become something of an icon in the region, and as such, its decline is of great significance. Shedding patterns, which greatly impact the weight of a lobster compared to its size when caught, are no longer reliable, which means that lobster fishermen cannot rely on certain seasons to make up expenses through better sales. Lobsters are also moving to deeper water earlier in the year, and the bulk of the catch is occurring later in the year. These changes, not visible to most of us, have those whose livelihoods depend on lobsters very worried. "If the lobster fishery collapsed, it could (...) I mean, it could change Maine." Elliot Thomas, lobster fisherman. Mosquitoes have been a scourge of human existence throughout the history of our species - not as a threat themselves, but as vectors for a wide variety of illnesses. 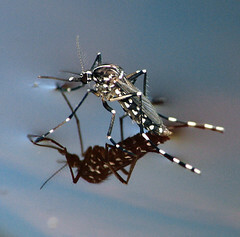 The Asian Tiger Mosquito's historic habitat is tropical and subtropical Asia, however since its first introduction to the U.S. through Texas, it has spread rapidly through the country. In recent years it has been seen in southern New England, and in the spring of 2011, it showed up in southern Massachusetts three months earlier than it ever had before. As with all mosquito species, the Asian Tiger Mosquito can transmit a wide number of pathogens, including Chikigunya, a debilitating virus that gives a high fever and joint pain reminiscent of severe arthritis. No cases of new mosquito-born pathogens have been reported in New England, but the arrival of tropical mosquito species in new regions raises the odds of the diseases they can carry showing up in those regions. Overfishing has caused problems for cod for some decades now, possibly longer. The pressure of constant harvesting by humans makes it difficult to be certain of the causes of range shift in fished species. Some species that lived in northern waters before European settlement are now considered "warm-water" species, but it was fishing that drove them south, not temperature. Cod have hung around, but recent work tracking fish populations in the northwest Atlantic, including the New England coast, has show that cod are not only moving north, but are also seeking deeper water, where temperatures tend to be lower. As a species, cod have been of great importance to the development of New England. The most obvious illustration of this is the name of the region's most visible coastal feature - Cape Cod. They are still an important food stock, though less common than they were, and cod liver oil is still a common supplement found in most pharmacies and grocery stores. Cod fishing is no longer a staple industry in New England, but it is an integral part of our history. While the long-term impacts are uncertain, over the past few years, warming has led to a longer growing season for sugar maples. Whether that benefit will be cancelled out by drought, or other possible costs associated with climate change is uncertain. Changes in seasons have had a subtler impact on their physiology, however, that we have been able to track through the maple sugar industry. The seasonal conditions of a below-freezing night and an above-freezing day that produce the reliable sap flow we get our maple syrup and sugar from have been increasingly unreliable. As a consequence of this, sugar makers throughout New England can no longer rely on traditional markers for when to start tapping their sugarbush, and must instead be on the alert for the conditions whenever they arise. Looking into the future, some predict that the viability of the maple sugar industry is moving north with the conditions, and before long, Quebec will have the seasons that made New England a center for syrup production. The little brown bat has been hit hard by the white nose syndrome, and are among the species being killed en masse by wind turbines, but in addition to that, recent research has shown that as summer droughts worsen due to climate change, bat populations decline. The reason is fairly simple - when there's a drought, the insect population drops, and so bats have to put much more effort into finding food, and less into reproduction - the end result is fewer new bats every year that's low on water. The impacts of a reduction in bat populations are many. The most obvious is that they eat mosquitoes, which are notorious disease vectors, carrying such classics as malaria, equine encephalitis, West Nile virus, and more. On top of that, however, is the recent revelation that bats eat enough agricultural pests that if they were to go extinct (which is likely for the little brown bat), it would cost the agricultural industry billions of dollars, perhaps tens of billions.